GET BUSHFIRE READY with Davey: Firefighter Factory Cashback! A solid fire safety plan is the first step to ensuring you are on the way to being bushfire ready this summer! The second step is to ensure you, your equipment, and your home are protected. An engine-powered pump is the ideal protection for your assets and loved ones, as well as post-fire protection and prevention (such as in the case of burning fences, vegetation, and surrounding structures.) For places where power may not be easily accessible or available, Davey Firefighters are the ideal pump for the job. With a range of 27 models in the petrol variety alone (all with varying engine sizes and the option of three or four way outlets), there is a pump to suit every property. Few people are ever fully prepared for an emergency like a bushfire outbreak and the speed at which the fire front can travel. Consequently, they allow little time to implement an effective fire defence. Establish your fire plan early, and adequately brief and train all family members in its resources and features. That way you rest assured that your family and property have protection whether the whole family is on site or not! And finally, ensure that all your fire protection equipment from a Davey Firefighter, to your hoses and nozzles, are well-maintained and able to operate without delay. All members of the household should be familiarised with the fire pump. This includes being proficient in the location, operation and fitting of attachments (such as inlet and outlet hoses) to the pump. Equally as important is knowing where protective gear and fire safety equipment is stored, such as clothing and googles. A well-rehearsed and documented fire plan is critical to personal survival and the protection of assets. In the event a critical situation arises, investing time into pre-fire season training will be of vital importance. Although diesel fuels have a longer shelf life, they generally need to be kept at low ambient temperatures to extend storage time. Major fuel companies estimate that diesel fuels have 12+ months of life at a temperature of 20°C, or six months at a temperature of 30°C. Running the engine of your pump regularly will ensure that oil is well distributed around the moving components of the machine to provide the best possible lubrication and a longer working life. The air cleaner or air filter of your firefighter pump needs to be checked and replaced as per the recommendation of the engine manufacturer. This is necessary to ensure you pump set has adequate clean air access for operation. Protecting the pump from radiant heat in a flame-proof enclosure is the ultimate solution for keeping a firefighter pump cool, and has a dramatic effect on the power your machine can deliver. Adding a mist spray around the pump or enclosure will also aid cooling and help to humidify the air. Having a general maintenance regime that involves regular checks will ensure that fuel lines are in good working condition and the recoil starter works without issue. Time spent investigating, assessing and maintaining your water system is also important. Regularly check your system for leaves, debris and sticks. These can impede the inlet system, while for permanent installations, a foot valve and strainer at the end of the suction line can overcome obstructions. The system should be regularly checked for air leaks and that all gaskets/seals are in good condition. Where possible, having an underground ring main installed around a property with durable hydrant or standpipe outlets can give you much greater coverage and even shorter hoses with increased resistance to ember attack. 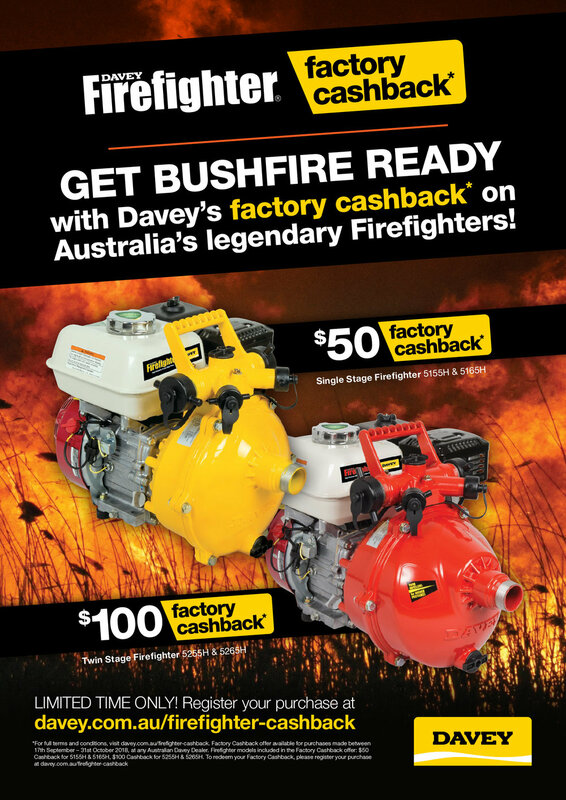 To help prepare for the upcoming bushfire season, Davey are holding a promotional factory cashback deal on their range of Davey Firefighters! Smart Water Shop are proud Davey Master Dealers and suppliers of the quality Davey Firefighter units, so pop in-store today to take advantage of this great deal. This offer applies to Davey Firefighter Sales from all Australian Davey Dealers from 17 September – 31 October, 2018. Factory Cashback Redemption is SIMPLE. Fill out the form online to register, upload a copy of your receipt as proof of purchase, and your cashback will be paid!